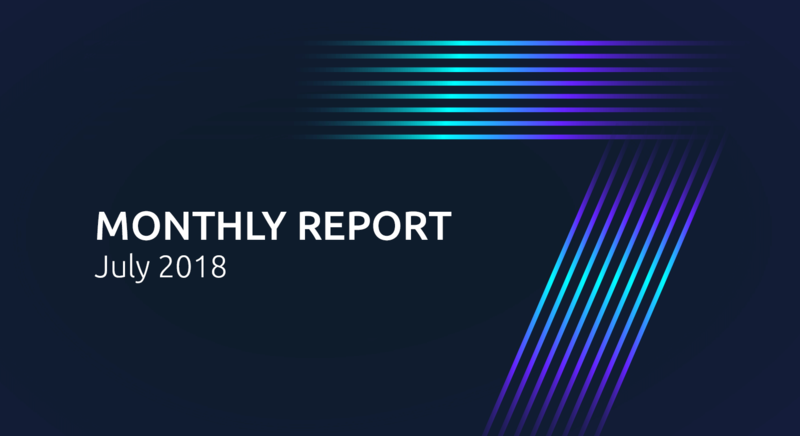 July was a month of new steps in the growth of SONM. After the release of our main product, which we talked about in detail in our June report, our team began to concentrate on upgrading the platform and the SONM wallet. We strengthened our development department and created a tech support department in order to be able to react to requests from members of our community 24/7. In July we added to the project documentation, adding more information for those who wish to dive deeper into the work SONM is doing. 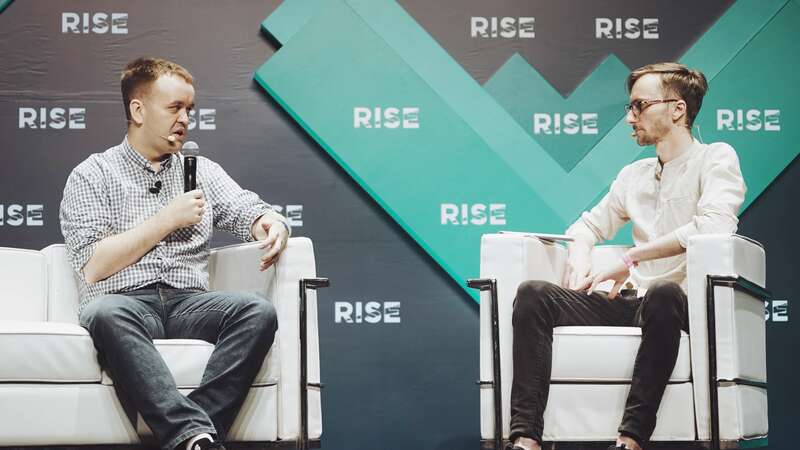 The project also took part in RISE, the largest and most authoritative technology conference in Asia. This event gave us the chance to announce SONM in the Asia-Pacific region. Participants of our community could keep tabs on what was going on at RISE via social networks, where we talked about all the important events of the conference. In order to increase SONM’s brand recognition we created an advocacy program, which content makers, influencers and bug hunters can already connect to. Below you can read about our achievements in July in more detail. Zero fees token transfers. Account holders now have the possibility of transferring tokens in the sidechain without paying a commission. Auto-installer prototype. SONM users will have the possibility of automatic installation by August. Genetic algorithm for the Optimus bot. While previously Optimus used only the mathematical regression method to determine distinct resource prices in combination with a greedy algorithm to solve multidimensional backpack problem to calculate optimal ASK plans (how to best sell your hardware), the bot now also uses a couple of genetic algorithms for backpack problem. Optimus then uses the most profitable solution out of three different algorithms results (greedy and two genetic). GPLv3 license. We have abandoned an Apache license in favor of GPLv3. It is stricter and does not allow the code base to be used for the development of products with a closed source code. In the future we plan to create an even stricter license, which will not allow the system to be used in isolation from the SONM token. 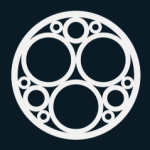 To provide a guaranteed basic revenue for any supplier joining SONM network. We run at least one Connor instance, that is doing marketmaking on SONM market. This way the market is always filled with orders, so Optimus bot can have an estimation of minimal resource costs. Connor then rents all idle resources and then starts mining Ethereum and pays his suppliers the same amounts, as he earns with mining. It is designed, that SONM can be used to mine more profitable altcoins, and there are professionals, who know how to achieve higher profits mining altcoins, higher than just Ethereum mining. These professionals can use SONM to do “cloud mining” – mine coins with a revenue higher, than the rental costs. These professionals will want to automate their work, and Connor is an opensource example and template for them to start with. Connor can be easily modified to rent resources to mine other coins, to use different pools and strategy. Benchmarks for Zcash and Monero. New benchmarks have become available for Zcash and Monero. There is already a benchmark for Equihash (Zcash), which is used on all hardware. There is also a Cryptonight (Monero) benchmark, but this has not yet been included in the version. KYC. KYC3 level is currently available only in manual mode, although the automated system is in the final stages of preparation. Interface. Adjusted interface in the section for viewing deals and orders. Here is a list of changes that we made to the operation of the SONM GUI in July. Update to configuration files — components connect to Livenet by default. Processing of short-term network errors in relay. Receipt of orders from DWH takes place on demand, although caching of received orders is also saved. Denial of surplus requests to the worker when requesting the status of a deal if the user is not a consumer in this deal. Correct display of tags when viewing the status of an ASK plan. We have also added a special section with the procedure for consulting tech support: besides Telegram, we are now accepting requests for tech support via email. For the convenience of SONM users we have created a bot on the Telegram instant messaging app. Telegram bot can be used to inform users on deal settlements. It can also be used to monitor deals and orders. Here is a detailed instruction. In order to subscribe to the bot, follow this link and press “Start”. In July SONM took part in the biggest technology conference in the Asia-Pacific region, RISE. The event took place from July 9-12 in Hong Kong. A total of 15,000 visitors from more than 100 countries attended the conference, at which 350 speakers appeared. This year was the first one for SONM at RISE, but the team took a bold approach and presented one of the event’s most eye-catching stands. The black space was finished in SONM’s signature futuristic style and featured big white logos that contrasted with the green flooring, a lightbox with the team’s schedule and meeting availability at the event, and a giant piece of sci-fi artwork on the back wall. One of the main attractions, however, was the already famous SONM Fog Bar, with its “foggy” cocktails. 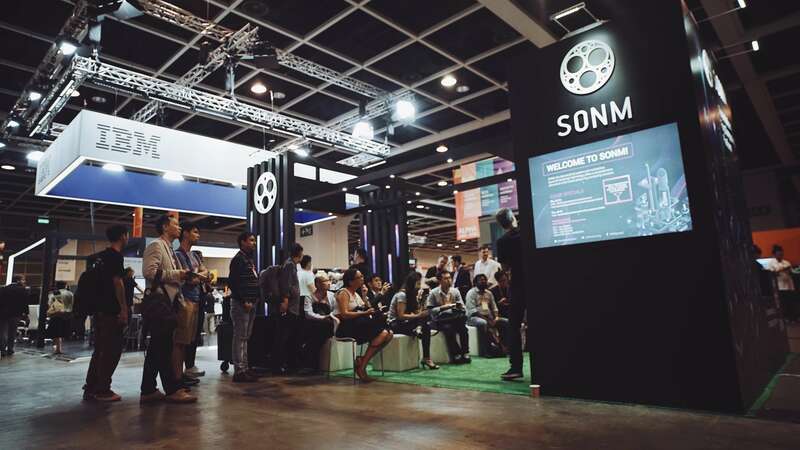 During the conference, more than 500 attendees visited the SONM booth and watched a presentation of the product. Most of them exchanged contact details with the SONM team with possible future cooperation in mind. 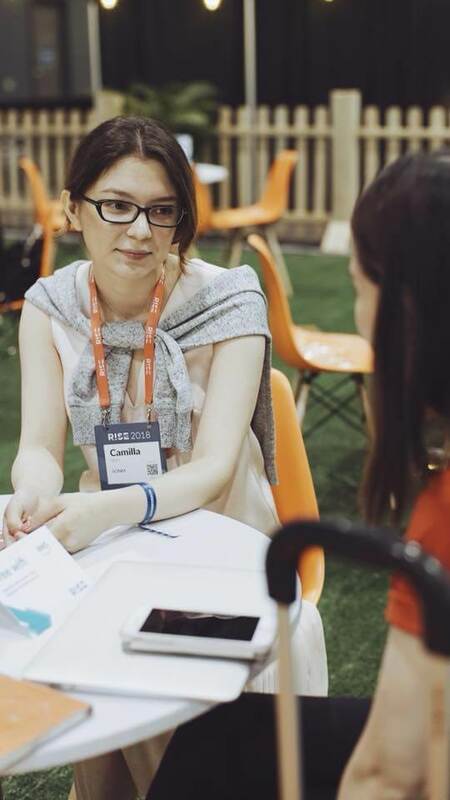 Camilla Shin, head of marketing at SONM, kicked off the series of events organized by the team by hosting a mentor hours session supported by Amazon Web Services (AWS) on the first day of the conference. 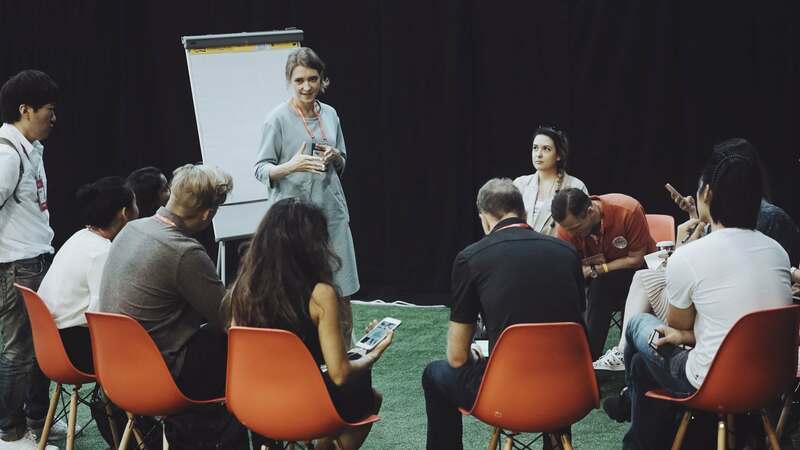 During the session, Camilla sat down with three startups from Singapore, Indonesia and the Philippines and shared her experience of international marketing, community engagement and communications. Olga Kazmina, SONM CMO, hosted a very special event on the second day of the conference. The theme was: “European Perspective: How to jump-start marketing in Asia and reach the Asian community”. The roundtable was fully booked, and conference attendees who couldn’t join the event visited the SONM stand afterwards to ask questions. Keynote speech: on the last day of the conference, SONM’s CTO Igor Lebedev gave a keynote speech titled “How Fog Computing and Blockchain are Disrupting the Cloud”. He later took part in a panel discussion on “The changing Shape of Cloud Economics”. Ken Tamagava of SORACOM Inc. and Christopher Udemans from Technode took part in the panel discussion alongside Igor. 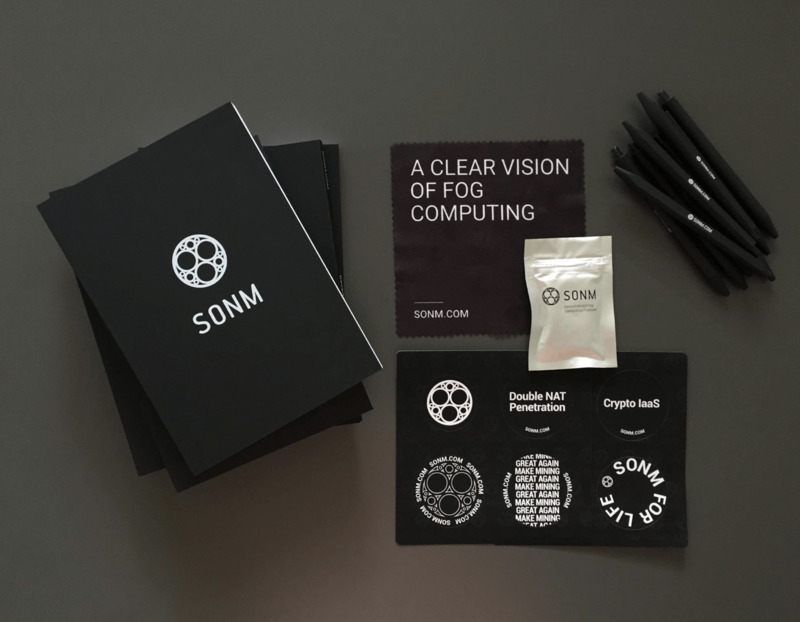 SONM notebooks, monitor wipes, pens and sticker packs. The RISE event in Hong Kong last month was three intense but productive days for SONM. The team is incredibly grateful to all who helped us with organization, the stand, and networking. See you next year! Here is the schedule of our events for the coming months. We’ll share the details of our participation in these events in our monthly reports. For those who had to stay home, we tried our best to show the atmosphere of the conference and highlight the most important moments and events. We used the feed of our social media accounts to stream everything that was happening to SONM in Hong Kong: project presentation at our booth, SONM speakers’ speeches and other moments that deserved your attention. Did our best in #HongKong! Happy to summarize: we promoted #SONM within the Asian audience, made new friends in the industry and met a lot of tech enthusiasts! 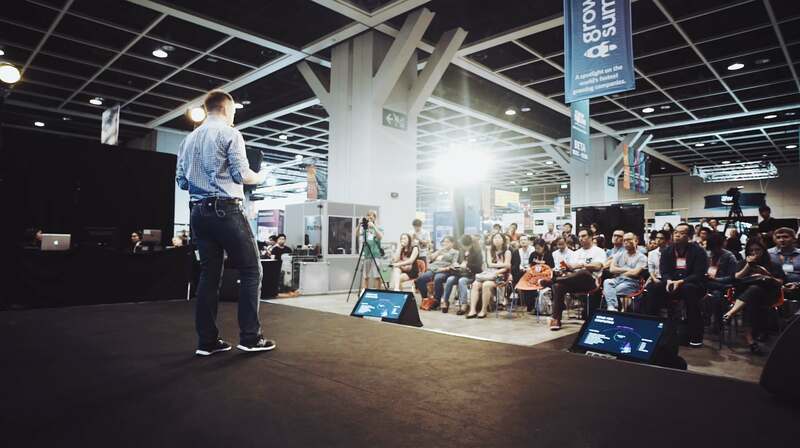 Thank you #RISEConf! In order to involve audiences in more active communication with the SONM project we have developed the Brand Advocacy program. This may be of particular interest to everyone willing to help SONM by popularizing the company, attracting new users, even with some technical tasks, and get rewarded for all of the above. Participants can prove themselves as content makers, influencers and bug hunters. The selection results will be used to give each participant a choice of tasks according to their abilities and skills. Keep up with the Brand Advocacy program and don’t miss an opportunity to show off your talent! In July, we reached a new benchmark. The company overview was published on one of the most influential tech media VentureBeat. It features only TOP companies, and its opinion is valuable not only to crypto community, but also to the broader tech one. For SONM it marks a next-level achievement and entrance to the English-speaking technology community. VentureBeat’s visitors number reaches 6,4М. SONM co-founder Alexei Antonov gave an interview to the blockchain platform blog Lisk, in which he talked in detail about the role of SONM in the fog computing sector, about its advantages over its rivals, and the prospects for the project. Also Alexei Antonov participated in Blockchain partners summit in Seoul and was impressed by the advanced regulation of the blockchain industry and the overall excitement and interest to it. He kept the community informed on his Twitter. He had four interviews with local media. In particular, he was featured on news.naver.com with 126.60M visitors. It demonstrates the high interest to SONM in Korea! SONM COO Oleg Lyubimov wrote a column titled “How Fog Computing Disrupts the Cloud Services Market” for Embedded Computing Design, a news website for the industry that details the latest embedded computing technologies for devices in automotive, DIY, mobile, home, industrial and medical markets. In his article, Oleg discussed the trends on the cloud computing market and the alternative that the SONM decentralized fog computing platform offers the market. Andrei just joined SONM and will focus on Kubernetes integration. It’s a right place for his skills and expertise, previously he supported an open-stack cluster of 4,500 nodes at leading Russian search engine Yandex. Following the launch of Livenet, SONM’s tech support service has been changed. Dmitry Manin was already working in the department, and now has been named a head of customer service. Now the latter is available 24/7 in Russian and English. Prior to SONM Dmitry was responsible for client relations in other companies, including international ones. We are very excited for his success! July was an important month for improving the functionality of the platform and wallet. This month we took one more step toward increasing recognition of the SONM brand around the world by presenting the project to participants in RISE, the biggest technology conference in the Asia-Pacific region. 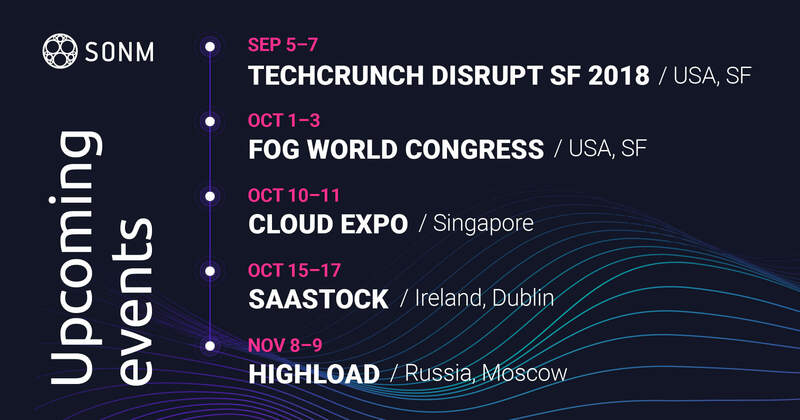 In August all month we will be preparing to take part in TechCrunch Disrupt, the largest tech convention in the United States, which takes place in San Francisco from September 5-7. Keep up to date with our news!